Richard Peperell and Christine Searle won the first of our three Drawan Partners Tournaments today after only qualifying from their block by the slimmest of margins - One Hoop! Ian Norris and Pauline Wood were the only undefeated pair at lunch but fell at the 13th hoop of their semi to Helena Fensome & John Etheridge. Ultimate victors Peperell & Searle snuck past Don Rutherford and Colin Morgan, again at the 13th hoop, but the final was clearer-cut at 7-3. It was a shame that only half the maximum entry took part in this tournament. Perhaps it was the call of the General Election toady, coupled with the shoes and handbags on sale at the PCC Spring Fair, that diverted attention elsewhere, but whatever the reason it was rather disappointing. Delia Norris brought her handicap down to 6 (that's her second 'drop' this season!) as she continued her sparkling form in handicap games by winning both her singles and one of her doubles in this now traditional league opener, won for the first time by PCC 'C'. Raghu Iyer went one better in victory terms and was undefeated in both his singles and doubles in this tight encounter in which 9 of the 12 games ended either 7-5 or 7-6. Well done to the 'C' for this fine start to the defense of their League title. PCC 'C' - John Chalfont (Captain), Delia Norris, Colin Morgan, Dianne Browne. PCC 'B' - Raymond Wood (Captain), Don Rutherford, Roger Goldring, Raghu Iyer. Our AC B-Level team went down at Winchester 1-2 today. Harry Midgley lost -9 yesterday and then today Chris Roberts won +4 and Frances Colman lost -14. With the experienced hand of Brian Bucknall (handicap 9) providing the guidance, AC newcomer Hugh Crook (24) shone, as the pair won our Doubles Handicap tournament held over the past two days. 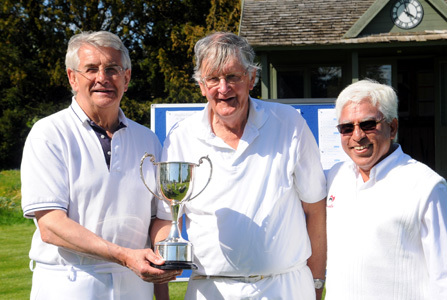 Six 'master and apprentice' partnerships contested the Barnses Cups, as is the usual arrangement for this event. Chris Roberts (1.5) and Pauline Wood (24) lead the field undefeated after three games at the end of the first day but they couldn't maintain that form, and were skittled out cheaply by Frances Colman (6) and Richard Peperell (22) on the morning of day 2. This set up the exciting prospect of tournament victory being possible by any one of three contenders going into the last round of games. Roberts and Wood needed to beat TJ Johansen (5) and Helena Fensome (20) which was clearly going to be a tall order as the latter had grown in AC confidence and was rouqeting and hoop running from all manner of unlikely distances! She 'has the GC shots' that could prove a big asset if she continues with her AC learning, which one seincerely hopes she does. Johansen and Fensome duly got the win and then had to watch the last 15 minutes of Bucknall & Crook's last match, hoping they came unstuck against Colman & Peperell. It was a close one, with Peperell (who had earlier 'peeled' his senior partner) having a last turn break chance that he shouldn't have been afforded, but an attempted controlled hoop run 'blobbed' and that was that. Bucknall & Crook tied on 4 wins from 5 games with Johansen & Fensome but had won their head to head match and so won the event on the 'who beat whom' rule. Thanks to Raghu Iyer for a well conceived and run tournament, which was enjoyed by all and our five novices especially. 18 May - PCC 'A' beat Winchester for the first time! Our GC Level League team beat Winchester for the first time today, thus recording our second league win of the season. And we didn't just win, as the 6-1 scoreline reflects! This was a terrific result against a strong team, against whom we have traditionally struggled. After a rain delayed start, Chris Roberts and Helena Fensome won the morning doubles against two 'scratch' players, and both Mike Fensome and Pam Mead won their opening singles against very experienced opponents. This meant we only needed one win in the four afternoon singles to secure the match. Roberts and Mike Fensome both complied and when the rain returned, it was decided to halt proceedings with our ladies matches both tied at one apiece, as the match result was beyond doubt. PCC 'A' - Chris Roberts, Helena Fensome, Mike Fensome, Pam Mead. PCC 'A' got our Level League season off to a fine sart today with a 7-0 demolition of Harwell. Our hosts were outgunned by our more expereienced players who dropped only one game in winning all seven best of three matches. PCC 'A' - Chris Roberts, Helena Fensome, Mike Fensome, Frances Colman. Roger Goldring came back from 3-5 down to win four hops in a row and retain his coveted 5+ 'Red Ball' Tournament title. This is the first event Roger ever won in croquet and so he revealed that winning it for a second time was all the more special. Ten players contested this seasons' tournament and a series of very close results told the tale of a generally evenly match field. from his AC principal persuite, to support this GC event. and be required to play of for overall their place which Browne won. The final was a tense and consequently slow paced affair that looked to be in Peperell's pocket until an unfortunate failed jump at hoop 9 pushed Goldring through. The defending champion converted his 'first shot' advantage at hoop 10 to tie the scores and then some good clearances at 11 turned the game in his favour. Peperall seemed as delighted for Goldring after the winning shot, as if he had won himself, and it was lovely to see such generosity of good sprit, so in keeping with the traditions of our splendid game. 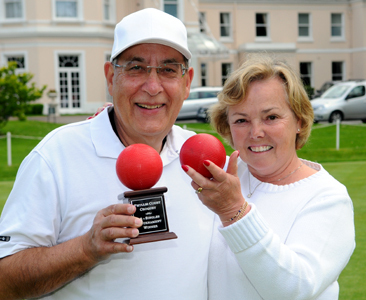 To the victor the spoils but both finalist duly qualify for the Croquet Association's Center Stage Competition Final at Ashby on 13 September. Chairman Harry Midgley took a team of very mixed experience to Oxford today, ranging from his own and Brain Bucknall combined playing days of over 50 years, to Richard Peperell, playing his first ever singles game. Bucknall and fourth member of our team Raghu Iyer were undone in short time by the hosts own very new players, but Midgley and (doubtless to his own surprise) Peperell both won, to draw the match. Phyllis Court's Frances Colman and Chris Roberts, who played a s doubles pair throughout,recorded two wins and one loss. They take a break tomorrow before getting back into action on Monday and Tuesday. Oxfordshire completed their County Championship programme today after four days of play at Southwick (Brighton) and Compton (Eastbourne). The team, that featured Phyllis Court's Frances Colman and Chris Roberts, narrowly missed promotion to Division 1, in this their first season. They finished equal with three other teams on seven match wins from their ten games, all behind Division 2 winners Lancashire. But with a game wins tally less that the others, they were placed fourth and so missed promotion by just the one place. Consolidation in Division 2 for a further season will be no bad thing for 2016. 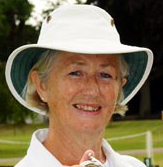 Congratulations are due to Pam Mead who reduced her handicap from 3 to 2 as a result of points gained at the recent PCC 'A' league win over Winchester. It is 'bitter sweet' news for PCC though because this now rules her out of our National Inter-Club Murphy Shield fixture v Leighton-Linslade on June 15. The competition rules only allow teams to field one handicap 2 player and with Mike Fensome already occupying that birth, a replacement for Pam is being sought. But well done Pam on your achievement.